Receiving new cattle to the ranch seems like a fairly simple thing. The first day kids land at Summer Camp may seem simple, but a similar strong emotional event happens -- new personalities, new climate, new rules, different environment, bugs, different bosses -- sometimes screaming and tears. The science of dumping a new critter in the ranch pasture seems simple, only if they are still there the next day. Consider some things that roll around in the mind of your freshly purchased valuable bovine investment. Texas Longhorn cattle have a homing pigeon mentality. For the first few days at their new home, they want to go back to their old home. The new grass may be an up-grade, better barns, better feed, but they still want to go back to the comforts of their old home. If a cow has been freshly weaned from her calf, both the calf and the cow are somewhere bawling and wanting to get back together. They are checking the fences for any open gate or low fence that might allow them to reunite. They may be 500 miles apart, but the homing pigeon/mothering mentality is 100% there. When receiving new cattle be assured freshly weaned critters must have stronger confinement for the first several days. It is ideal to bring home new purchases and place them in a sturdy corral where the cattle can be fed good feed and observed for a few days. To place a "bonding" animal with the new acquisition speeds up the "welcome home" process. To give a yearling bull one heifer to help him learn to like his new home is a perfect plan. In a small amount of time he will make friends and be relaxed, quickly forgetting the bull pasture he recently departed from. Corrals with open visibility are good. A small pipe corral 50' across is good. To place a new purchase in a horse stall is like jail confinement. They can't see out. They hate it -- hate it bad. Â A critter may have some body lice or parasites when they come off the trailer. To protect the new buyer, many professionals pour on Ivomec before sold cattle leave the seller's property. This mark of professionalism has great value. If cattle have co-mingled, like at a sale, with other cattle who have not been poured on, it is mighty important to pour on Ivomec before adding the new animal to the herd. Auction facilities are ideal for "sharing" bugs and bad things. Border line fences are always important. The two reasons for good fences is for the neighbor's cattle to stay on his side and your cattle to stay on your side. Don't be disappointed when the neighbor doesn't build sturdy fence; it won't ever happen. Be assured you will have to build the solid fence you want for yourself. The main fence tests happen when newly purchased cattle are dumped in the pastures, both for you, and your neighbor. Always have good fences. Your cattle may be trained to stay home with a one wire electric fence. When receiving new cattle don't assume they also have been trained to respect one electric wire. It may be wise to train new cattle by placing one electric wire across a corral to get them used to it in a confined area. Good plans are good. Climate change. Commerce in registered cattle is going everywhere, all the time. Although cattle can't tell you they are stressed out, sales, shows and hauling is very stressing. Cattle purchased in Texas and hauled to northern states as winter is coming on, is stressing. In fact a lot of cattle have been lost due to changing the climate faster than the cattle can change their adaptation. Seasons change slow, but cattle in a truck out of Texas in December headed for Montana will require special care, extra shelter, feed and maybe vet care. Climate change is brutal. Prepare to give this special care in relation to the climate's stressing quick change. Receiving a young promising bull has some issues to consider. It may be expected that this great young bull is going to quickly start breeding cows. However, one big steer in the pasture thinks that he wants to stay the king of the herd and this new bull is just in his way. He may fight the young bull off his business day and night creating a zero success calf crop. The same herd protective attitude may come from a big old cow who has not calved recently. These are management issues. Every owner must know how this works. Good managers separate horses and cattle. Seldom do these species coexist in a pleasant daily walk. Placing a new animal into the herd that has horses mixed in can create a fearful thing for the critter who has never seen a horse. Horses and cattle have totally different defensive methods and it doesn't come easy for the newly received animal to know the ropes right off the bat. The new critter is going to lose the battle. Dogs are used around some cattle, but newly received critters who are not "dog savvy" will most likely react in an unorthodox manner. Many cattle have never seen or heard dogs. When dogs are all over the place it may create a spooky environment for new cattle. Cattle have a natural instinct not to like wolves, coyotes or mountain lions. When the family dog has similar smells to a coyote, don't be surprised when a cow takes a run at your dog. People go mostly by eyesight. Cattle go more by smell and sound. New smells and sounds cause newly received cattle to not trust their new surroundings. All of these concerns can be reduced by extra good corrals and good management. When cattle unload and sniff the air, look at the horizons, act scared, it is mostly because of what they are smelling or hearing. To receive new cattle, a plan for keeping them in a corral for 4 to 7 days with one or more bonding animals, then turning them with the herd is a safe and humane plan. 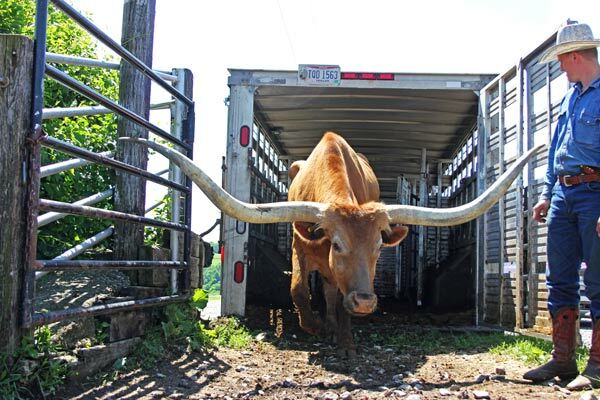 It will make for a smooth transition and you'll receive a happy new Texas Longhorn, comfortable, with a new happy home.